– In medium, heavy bottomed pot combine 2 cans of coconut milk, 3 tablespoons of date sugar, 1 tablespoon honey and 1 teaspoon of ground cardamom. – Whisk continuously over low heat until thoroughly combined. 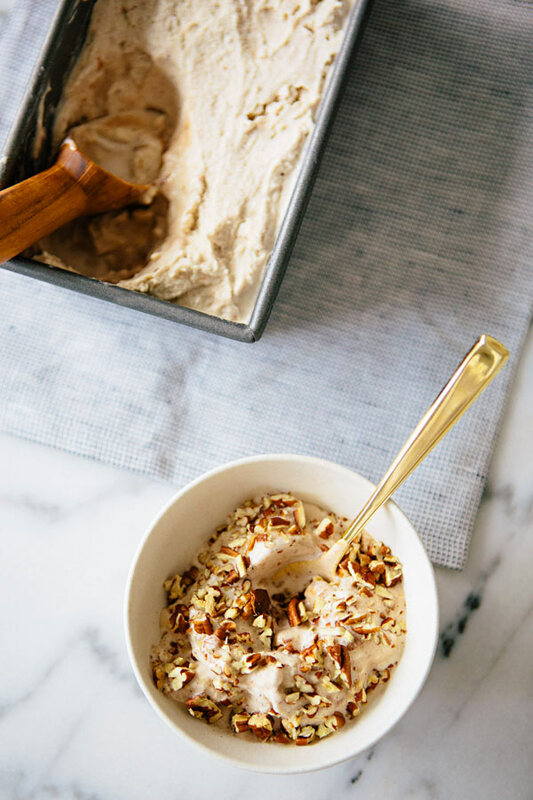 – Transfer ice cream mixture into a bowl and place in refrigerator for at least two hours or until very cold. – Give mixture one last stir and add to ice-cream maker, follow your ice cream makers instructions to finish for soft serve ice cream. – In a small mixing bowl combine 1/2 cup honey, 1 heaping tablespoon + 1 teaspoon cinnamon. – Scoop 1/4 ice cream into container, drizzle cinnamon honey mixture over top and then cover with more ice cream. Repeat until all ice cream is in container. – Cover ice-cream with wax paper (make sure it is touching the ice-cream) and place in freezer to set. Remove from freezer 5 minutes before serving. * I prefer eating it straight out of the ice cream maker when it’s soft and creamy and perfectly amazing! * Adjust sweetness according to your tastes- more or less date sugar in the mixture. But remember, the honey cinnamon swirl adds a LOT of sweetness! * I really love the crunch that chopped pecans bring to this too! Whaouuu. All this food seems to be so good! So many things to try. You convert me to kale, a little bit difficult to find in Paris, FRANCE, but we love it. Looks so good! I just started using cardamom. It's fun to have a new flavor to play with. 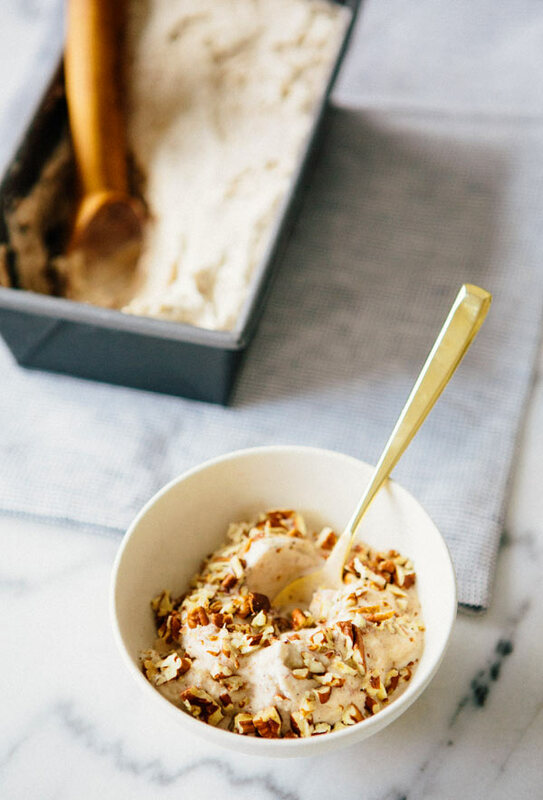 Love your wooden ice cream scoop! This looks so good. It's freezing in Toronto, Canada, so i'm gonna make this and imagine it is summer time while I eat a scoop or two. Your ice cream calls my name! Amazing. this looks so tasty! 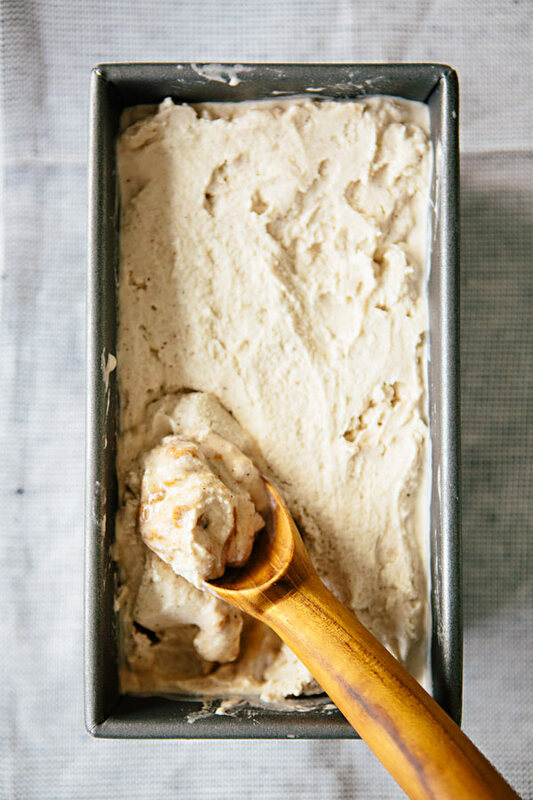 i have never thought about cardamom ice cream…but it sounds like a brilliant flavor. sorry to hear you had such a bad week, so glad most of your photos were ok! Oh dear! That sounds awful! And like something I can totally relate to. I hope things cheer up 🙂 This ice cream looks to die for! I love cardamom. Whoa! I may have to purchase a ice cream maker specifically to make this. You listed this recipe as Vegan. However, you added honey to this recipe … which isn't Vegan. It's actually unnecessary to use since you are already using date sugar (unless you want something in liquid form …coconut nectar, organic maple syrup, date paste with more liquid added are all better options). Please be mindful of the ingredients listed and how recipe is listed because not everyone will catch this. Thanks. Hi Cherylyn, You're so right, I always forget that honey is on the vegan "NO" list! I just changed it to dairy free. Thanks for the heads up! I love cardamom, but always use it in savory dishes. In my favorite Indian restaurant the make a similar dessert, so thank you so much for this recipe, will try this out! This sounds delicious! I love using cardamom as much as I can…it's one of my most favorite spices. Can I just ask where you got that amazing wooden ice cream scoop? Oh no – what a nightmare! One more reason to hate those nasty Chinese herbs. So glad the majority of the photos were recovered. This ice cream looks like pure heaven. I'm pretty much obsessed with cardamom and can imagine how perfectly it goes with coconut milk and honey. I can't wait to make it. Can i substitute the date sugar for regular dates? Kind of hard to find it in Mexico City. Hi Laura, I would substitute regular sugar rather than dates! Or if you can find coconut sugar or another form of crystalized sweetener- I just think the dates may not cook down enough. BUT, you could always give it a try! There’s pretty much no way it could be bad. 🙂 Just taste as you go and make sure you like the flavor before you pour it into the ice cream maker! I’ve used dates, gently warmed then pulsed in the food processor with the room-temp coconut milk. Your wonderful ice cream reached over the ocean and landed last night on my dinner for my girls in Stockholm Sweden! So yummy even though I need to practise a bit on our ice cream maker. Thank you for great inspiration in a our gluten and dairy free family life!